A lack of concern for the environment from "corporate farm owners" in Southland and Otago is of "huge concern" to anglers and farmers alike, the New Zealand Federation of Freshwater Anglers says. Southland sheep farmer and angler Daniel Kyle had been left feeling "frustrated" by an increase of effluent leaks in Southland streams near his farm. 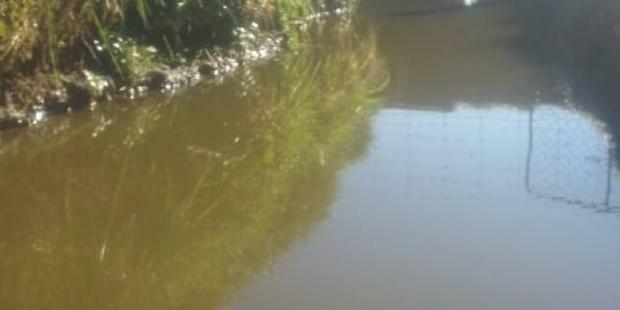 He came across an effluent leak in an open ditch which ran into the Opio Stream "for at least four hours" on Friday before Environment Southland found the source and stopped the leak. The leak was not the first Mr Kyle had noticed as a creek at the back of his farm had been "running green" at least twice, he said. "I've fished here all my life and since dairy moved in, things have turned to ****. "It frustrates the hell out of me," he said. New Zealand Federation of Freshwater Anglers president Graham Carter said while the majority of farmer owner/operators were "pretty compliant", corporate farm owners did not have the same concerns for the environment. "It's these corporate, intensified dairy farms that are killing it for everybody. They just don't care," he said. In the last 10 to 15 years there had been a "huge increase" in dairy conversions, which were affecting waterways. Listen: Dr Jacqueline Rowarth - Why are we eating endangered fish? "[Otago and Southland] had some pristine waterways that people go to for their holidays, just to camp beside them and have a good time with their kids. You just can't do that any more." Anglers should be watching for effluent leaks and reporting them to the Federation of Freshwater Anglers, so it could keep the pressure on local councils and related organisations, he said. After contacting Environment Southland (ES) for an update on the leak, Mr Kyle said he doubted the farmer would face "more than a smacked hand". While ES would not comment on specific cases, compliance team leader Melissa Washbourne said it was the consent-holder's responsibility to ensure compliance with discharge permits. "All consent breaches are investigated and follow-up action considered, according to Environment Southland's enforcement policy." This could range from abatement notices through to formal warnings, infringements, prosecution or alternative action such as restorative justice or diversion. The annual ES dairy discharge permit inspection programme could also identify any consent breaches, she said.